Last year, Aston Martin announced the end of the Vanquish’s production life as it seeks to move into hyper car territory in a shake-up of its existing line-up. 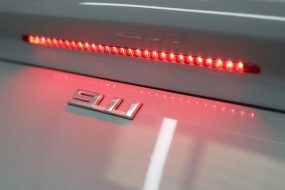 As a final hurrah to this hugely popular flagship model, Aston Martin has released a special edition. 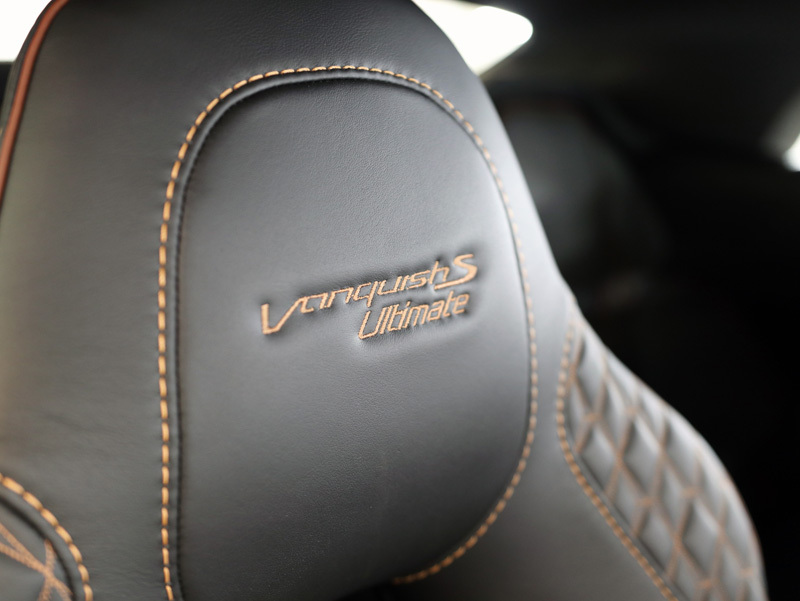 Designed to encompass the ‘best of Vanquish’ over the last 6 years, the Vanquish S Ultimate is undoubtedly an exquisite memorial and with only 175 being made, a rare one too. The two-door coupe body style rides on an extruded bonded aluminium and carbon-fibre body with cast-magnesium door structures and carbon-fibre body panels. Powering these weight saving measures is an uprated 6.0-litre V12 engine producing a maximum power of 595bhp at 7000rpm and a maximum torque of 630Nm at 5500 rpm. Ventilated carbon ceramic brake discs provide improved stopping power as well as being another weight-saving measure. 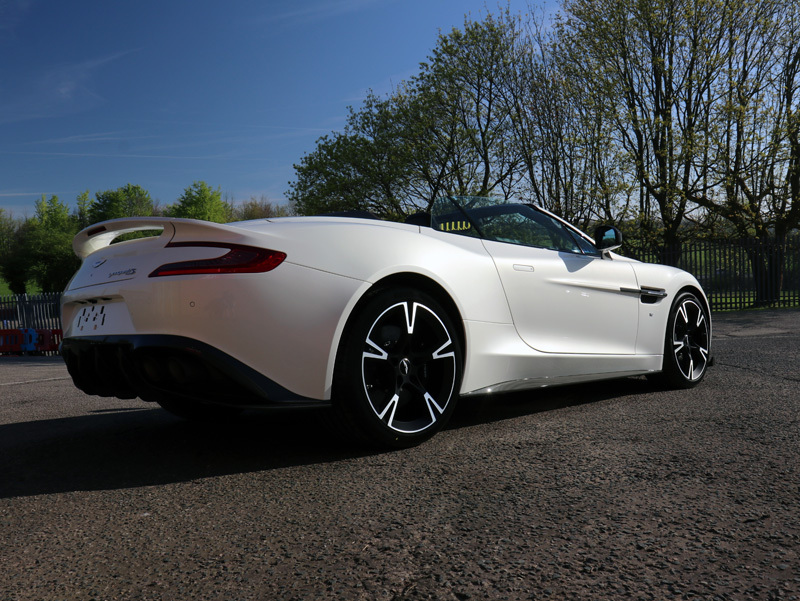 The Vanquish S Ultimate boasts a top speed of 201mph and achieves 0-62mph (0-100km/h) in just 3.5 seconds, which, when paired with the ear-splitting and heart-stopping sound from the exhaust, is enough to thrill any performance car enthusiast. 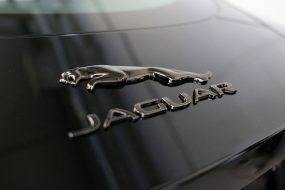 Offered in a choice of three exterior and interior themes, prospective owners can select Ultimate Black, Xenon Grey or White Gold paintwork, paired with a choice of three interiors – Obsidian Black with Chestnut Tan accents, Phantom Grey with Electron Yellow accents, Chestnut Tan with Obsidian Black accents. 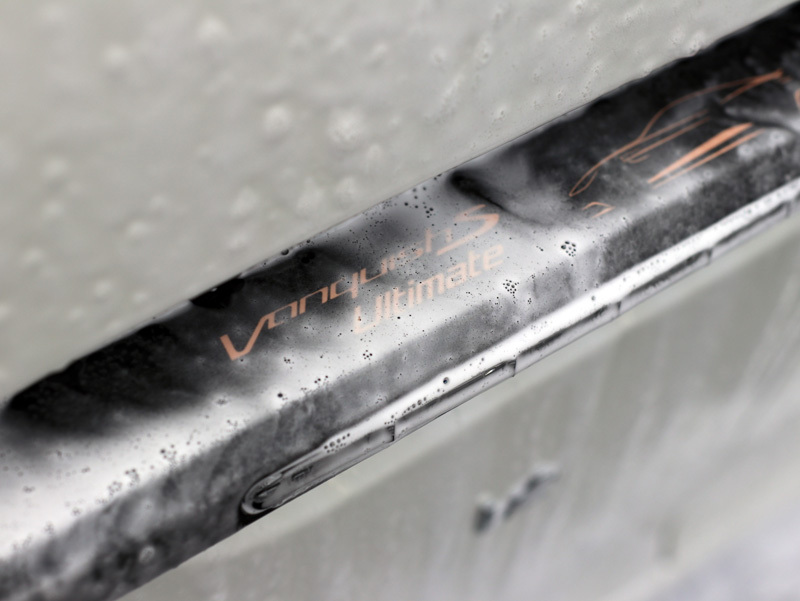 Aston Martin hasn’t been light on the visual carbon-fibre either, with 2×2 twill front splitter and front grille, side strakes with ‘Ultimate’ rose gold decal and bonnet louvres, and door scuff plates with ‘Ultimate’ 1 of 175 sill plaques. 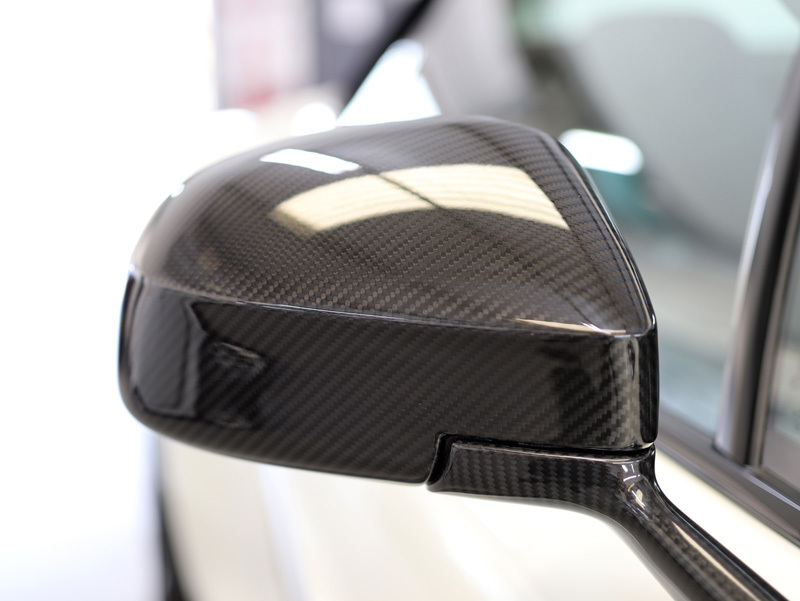 If that isn’t enough, plenty of other carbon-fibre options abound. 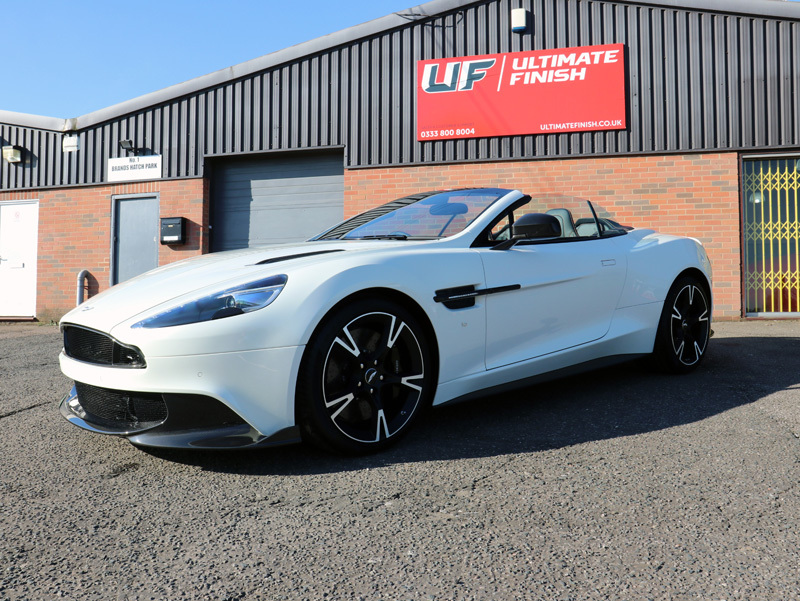 The owner of this Volante with White Gold paintwork and Chestnut Tan interior had experienced first-hand the benefits that New Car Protection can bring and subsequently booked in his new car for a complete protection package. 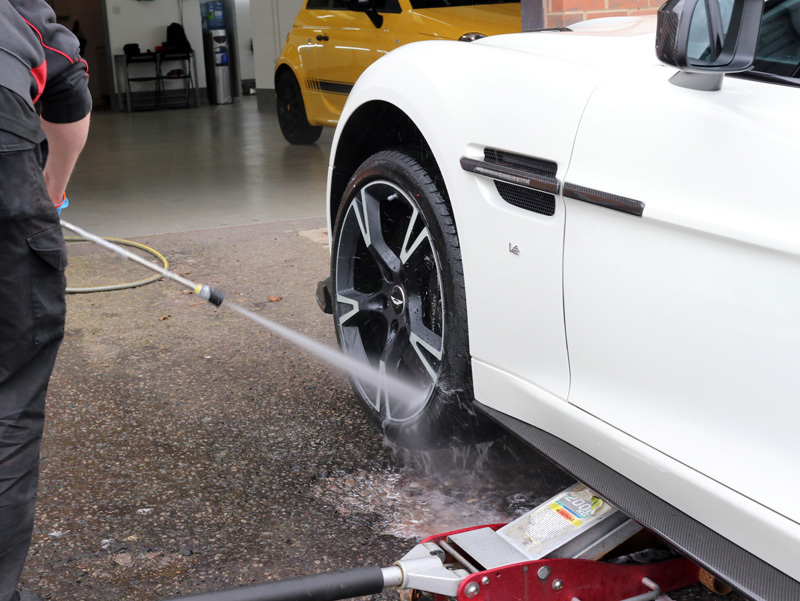 After an initial visual appraisal, the number plates were removed and a trolley jack used to raise the Vanquish, increasing the gap between wheel and bodywork, making it easier to access the arch and thoroughly degrease and decontaminate the area. 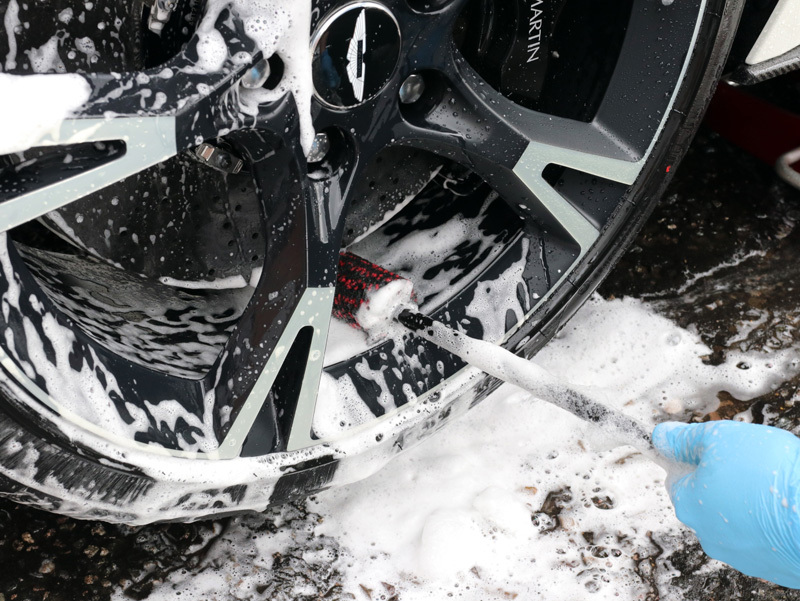 After rinsing, the wheels were washed using Valet PRO Bilberry Wheel Cleaner with ultra-safe Wheel Woolies to reach through to the back of the rims. The area was rinsed again using a Kranzle K-1152 TST pressure washer. The bodywork was degreased, treated for adhesives and then for iron contamination, in case any had adhered to the panels during transit from the factory to the dealership. Then, using a Kranzle-adapted foam lance, Ultimate Snow Foam was applied. The intricate grille was cleaned using a detailing brush to agitate the foam. The cabriolet roof, being brand new, required only a light clean with a low concentration solution of all-purpose cleaner. It was then rinsed thoroughly, ensuring all traces of cleaner were removed. 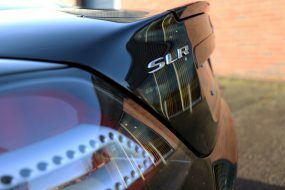 The bodywork was washed using the Two Bucket Method, the safest way to wash a vehicle, preventing dirt removed from the panels being reintroduced – a leading cause of wash swirls. The process involves keeping wash solution separate from the rinse water, each bucket containing a Grit Guard that the wash mitt can be brushed against, releasing dirt from the pile. The mitt is loaded with suds from the Wash Bucket, a section of the car cleaned, and the mitt rinsed in the Rinse Bucket water. After being wrung out, the mitt is then loaded up with soapy water again and the process repeated until the car is completely clean. After rinsing, an Aqua Gleam De-ionising Water Filter was used to deliver a final, pure water rinse. 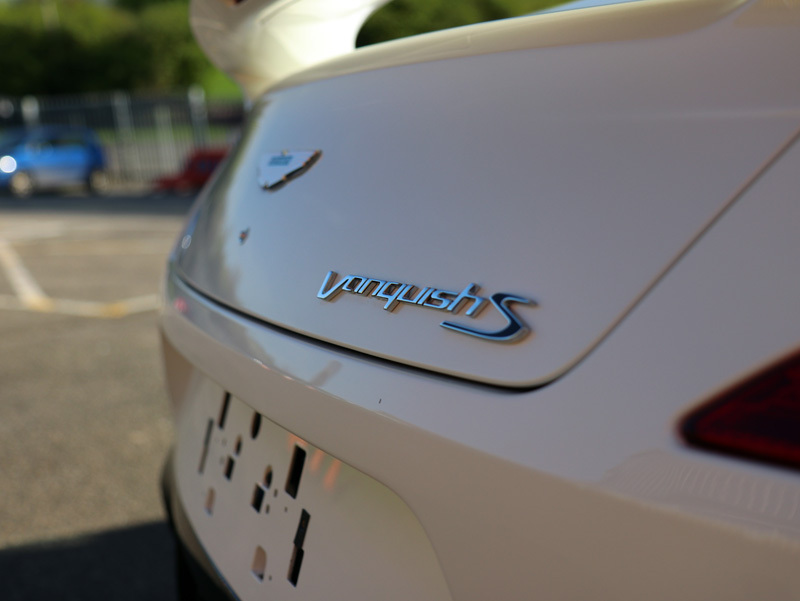 The Vanquish was brought into the studio and placed on a hydraulic ramp to allow for easier to access to all areas. A BigBoi BlowR PRO touchless dryer was used to chase water off panels and out from nooks and crannies. 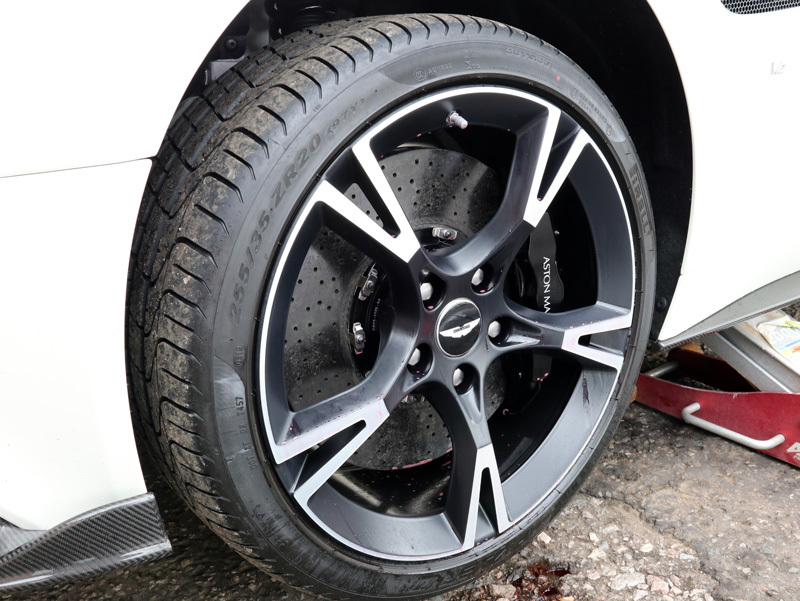 The powerful jet of warm, filtered air quickly dries complex areas such as around wheel nuts and under wheel arches. The BlowR PRO was also used on the fabric roof to ensure it was bone-dry, essential prior to the application of sealant. 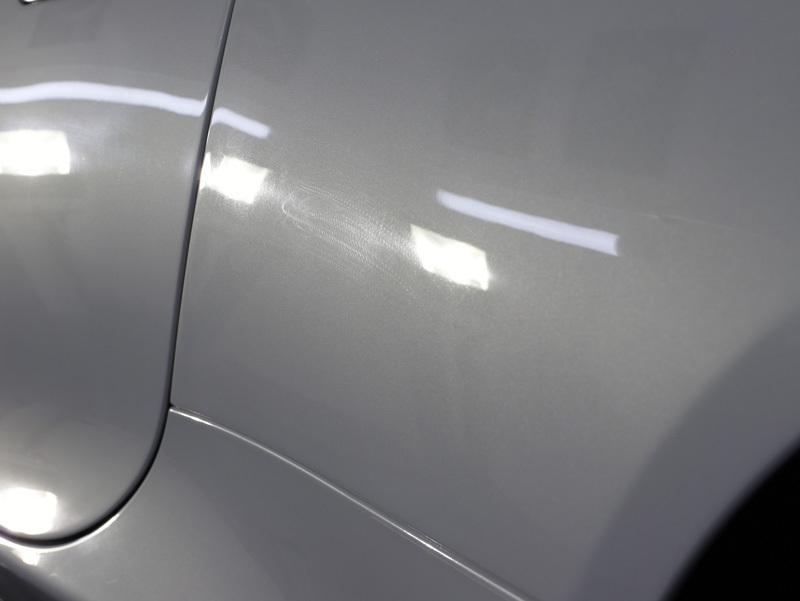 The paintwork was inspected using SCANGRIP high-intensity lighting to identify any blemishes and defects. 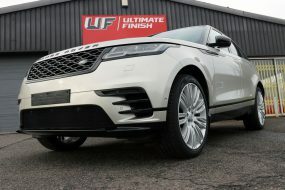 The extensive ‘pigtail’ sanding marks were removed using a RUPES LHR 75 Mini dual action polisher and Koch-Chemie Heavy Cut H8 on a 4″ RUPES Medium Polishing Pad. To refine the corrected paintwork, a Kamikaze Collection Banzai Dynamics Red Polishing Pad was used with Menzerna Medium Cut Polish 2400 producing a brilliantly glossy finish. The owner opted for Kamikaze Collection’s flagship ceramic coating, ENREI as the last step protection. 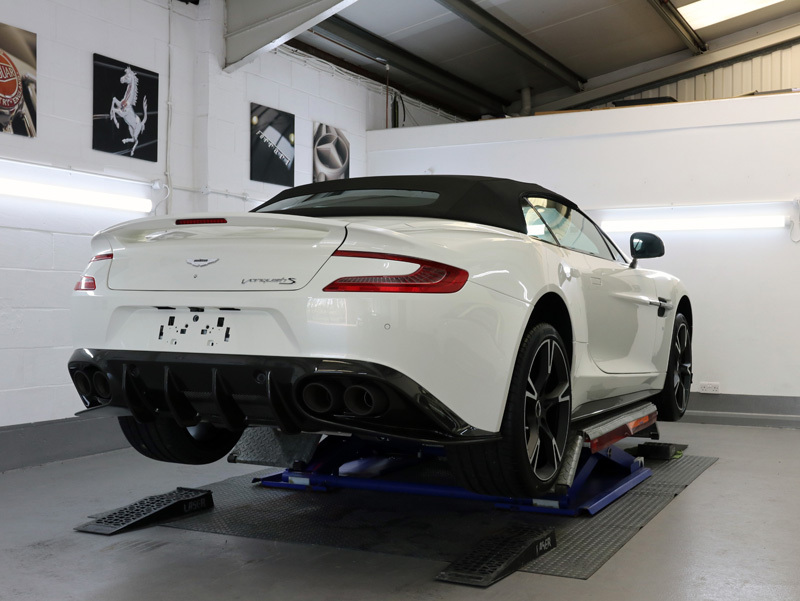 The bodywork was first prepared with Gtechniq Panel Wipe, ensuring any polish residues which might interfere with the chemical bonding process were removed. ENREI is a two-stage system comprised of No.1 Base Coat Primer to provide a smooth surface anchored chemically to the clear coat and providing enhanced chemical affinity to the second stage; No.2 Top Coat. ENREI is suitable for use on many substrates including visual carbon-fibre. The secret to the performance of ENREI lies not only in the engineering of the product but in the application process. 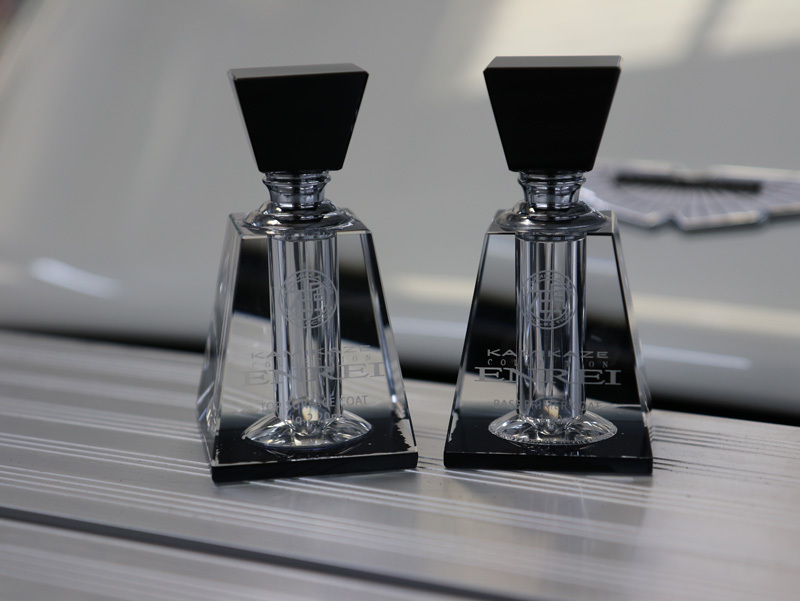 This has been developed through exhaustive testing by Kamikaze Collection International. In addition to strict application protocols, ambient temperature and humidity must be within certain parameters. As a result, ENREI is available only as a service through Kamikaze Collection trained detailers and the certified network is limited to preserve performance quality. To provide a hydrophobic barrier for the glass, Kamikaze Collection Intenso Window Coat was applied. 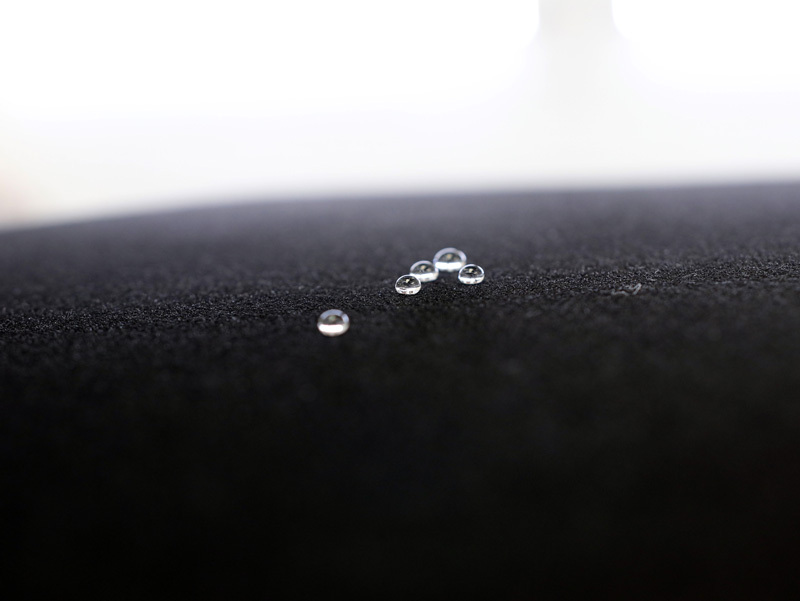 Once cured, the barrier encourages rainwater to roll into beads on contact, allowing them to disperse when driving at relatively low speeds. Whilst ENREI and Intenso were curing, the interior was vacuumed to remove surface dust and any loose dirt. 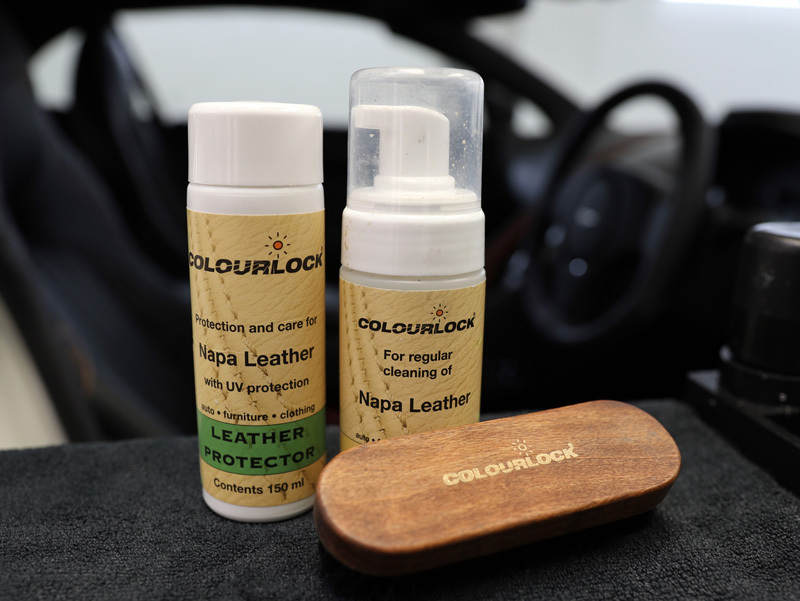 The leather was cleaned using Colourlock Mild Leather Cleaner, then protected with Colourlock Leather Shield. This spray-on coating leaves an abrasion resistant, water and dust repelling surface, with none of the sticky residue commonly associated with leather creams. Treated leather is easier to keep clean, less prone to staining and more resilient against the damaging effects of UV which can dry and weaken leather as well as fade the pigment. The dash was cleaned and protected using Gtechniq C6 Matte Dash AB, providing a dust-repelling surface with a persistent anti-bacterial function, the better to keep the interior smelling fresh. 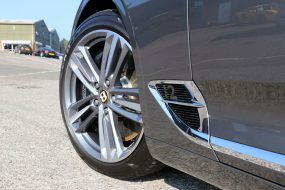 Then, the optional twenty-inch satin black wheels were prepared with Nanolex MATTE Surface Cleaner before being protected with MATTE Spray Sealant, the better to preserve the satin finish whilst providing a dirt and contamination repelling barrier. 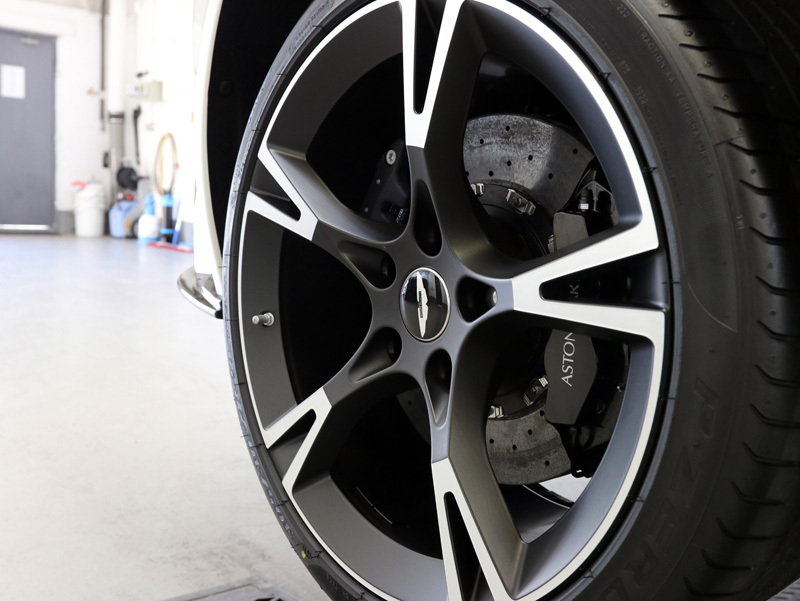 The tyres were dressed with Gtechniq T2 Tyre Dressing to provide a satin finish to perfectly complement the matte wheels. 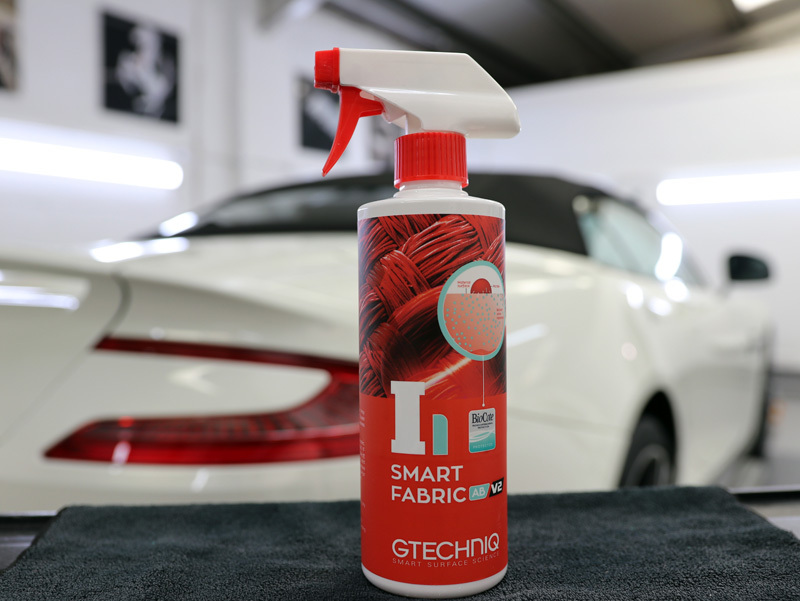 Once the paint and glass sealants had fully cured, the bodywork was masked with a covering and the fabric hood was sealed with a liberal application of Gtechniq I1 Smart Fabric AB v2. This spray-on nano sealant coats the individual fibres, preserving the texture of the fabric and protecting the hood against water ingress, dirt and contamination, environmental fallout and UV fade. 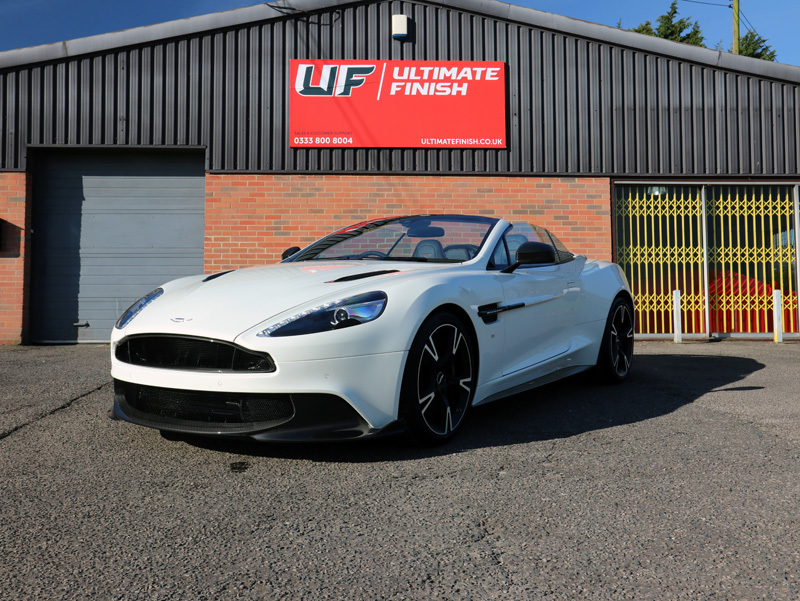 With the factory finish issues now resolved and all of the various substrates protected with the best products available, this sought after Vanquish will remain in pristine condition for many years to come. Volvo V90 PowerPulse Cross Country – Protected & Ready For Anything!